CHARLESTON, S.C. -- Prosecutors are using Charleston church shooter Dylann Roof’s own words to portray him as a cruel angry racist at his death penalty trial. Roof’s two-hour confession on video to killing nine people at a church Bible study, recorded the day after the shooting, was introduced as evidence Friday, along with a handwritten journal found in his car. “How could our faces, skin color and body structure be so different, but our brains exactly the same?” Roof wrote in one of the less offensive passages. 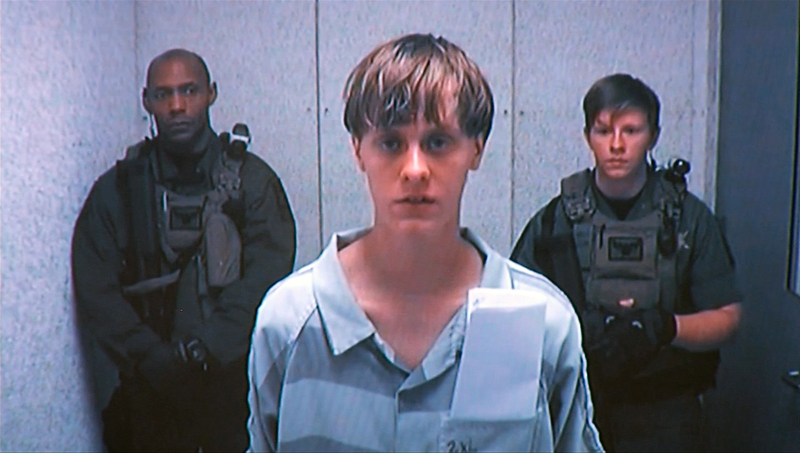 In the video, Roof laughed repeatedly and made exaggerated gun motions as he described the massacre. He wanted to leave at least one person alive to tell what happened, he explained, complaining that his victims “complicated things” by hiding under tables. He thought about shooting drug dealers, but they might shoot back, he said. Instead, Roof told the FBI, he picked the historic Emanuel African Methodist Episcopal Church in June 2015 because there likely wouldn’t be white people there, and the people he chose to slaughter were more likely to be meek. Surveillance video from the day of the attack in June 2015 showed people walking into the church. Then, in walks Roof, carrying a 45 Glock pistol and seven magazines. Once inside, he opened fire as the faithful rose and closed their eyes to pray. Roof’s lawyers have conceded that he carried out the attack, and are focused on persuading jurors to spare his life in the penalty phase of the trial. They said in opening statements they will call few or no witnesses. Testimony continues next week, and prosecutors said they may rest their case Wednesday. Roof also said the killing of Trayvon Martin was a turning point in his life. Martin, a young unarmed black man, was killed by neighborhood watch volunteer George Zimmerman in 2012. Zimmerman was acquitted in the shooting. Roof said he started researching black crime against whites on the internet. Roof hardly looked up as his confession played, mostly shuffling papers in front of him, as he has through much of the trial. In the recording, he told FBI agents he could never look at the families of his victims. And throughout the trial, he has not looked at the dozens of relatives in the courtroom.